A quitclaim deed in North Dakota will take effect and will vest the interest intended to be transferred by the grantor to the grantee upon its delivery (47-09-06). The post office address of the grantee is a prerequisite to recording (47-10-07). Additional requirements, such as a Certificate of Real Estate Value, signature of the grantor, and an acknowledgment, can be found in the North Dakota information section. Every grant of an estate in real property in North Dakota is conclusive against the grantor and everyone subsequently claiming under the grantor, except a good faith purchaser or encumbrancer who acquires a title or lien for valuable consideration by an instrument that first is duly recorded (47-10-08). 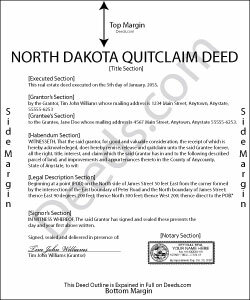 Recording a North Dakota quitclaim deed provides notice of the contents to all persons (47-19-19). If a quitclaim deed is not recorded, it is void as against a subsequent good faith purchaser who purchases the same real estate for valuable consideration (or portion of it) whose conveyance, whether it is entitled to be recorded or not, is first duly recorded in the proper county in North Dakota. If a quitclaim deed is recorded first, this does not affect the question of the good faith of the subsequent purchaser (47-19-41). An unrecorded quitclaim deed is valid between the parties to it and those who have notice of it (47-19-46). However, having knowledge of a quitclaim deed that is outside the chain of title does not constitute notice (47-19-41).